"It's important for educators to become aware of what products are out there in the woodworking industry so they can identify solutions that not only meet their budgets, but align with the goals they have in training their students." 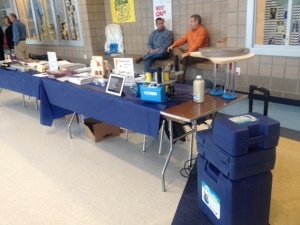 The Annual UACTE Winter Conference held at Westlake High School in Saratoga Springs, Utah provided an opportunity for industrial science teachers from Junior Highs, High Schools, and Colleges to gather together and learn about new products and technologies, and be trained further in their respective fields. Shop Gear Inc. accompanied Advanced Machinery Systems and TigerStop in supporting this event by educating those in the woodworking field on products in the woodworking industry. Wood shop instructors play a key role in the preparation of those who will become cabinet makers, shelving manufacturers, and furniture makers, among others. However, instructors are often in a difficult spot as they strive to train students using quality machinery and equipment while having to maintain a very tight budget. Ron Johnson of Advanced Machinery stated, "It's important for educators to become aware of what products are out there in the woodworking industry so they can identify solutions that not only meet their budgets, but align with the goals they have in training their students." The products that generated the most interest from the attendees were the SawGear Stop & Pusher system by TigerStop, the Hoffman dovetail machine, and the Portable Edgebander by Shop Gear. One wood shop teacher from Utah stated, "I thought I was going to have to pay around $8,000 for an edgebander. Now I can get what I need for a lot cheaper that doesn't take up much space." This conference proved to be very beneficial to those involved and Shop Gear looks forward to participating in these events down the road.